Mules improve to 7-1 by sticking to the script Tuesday night on the road. 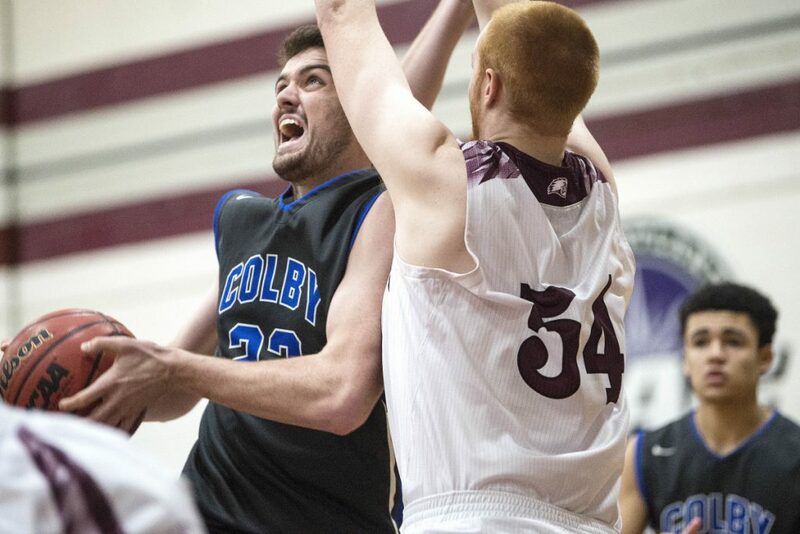 FARMINGTON — It’s hard to find a flaw in the game of the Colby College men’s basketball team right now. 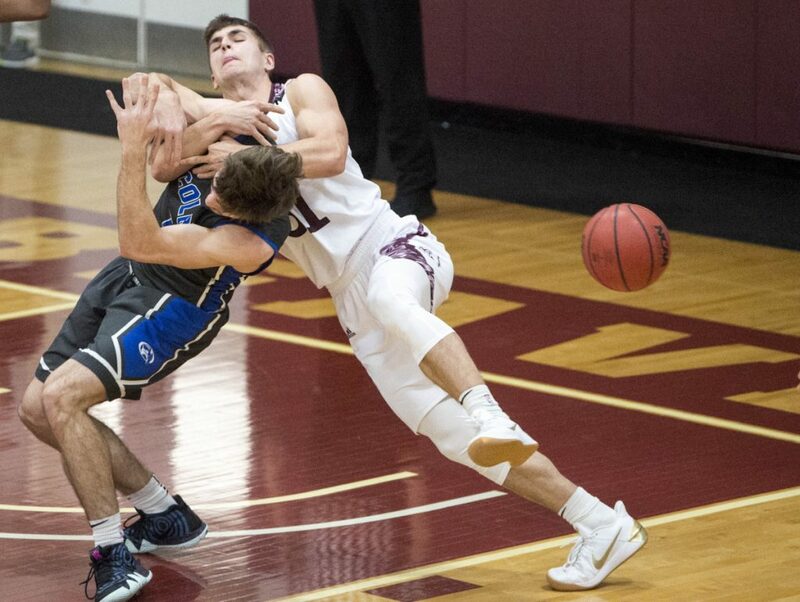 Tuesday’s 92-76 win at the University of Maine at Farmington upped the Mules record to 7-1, and the Mules took the victory in a way that has become their signature this season. Balanced scoring, 3-point accuracy and defense that was stingy when it had to be. “It’s been a real fun team to coach, because guys are playing within themselves and playing off one another. 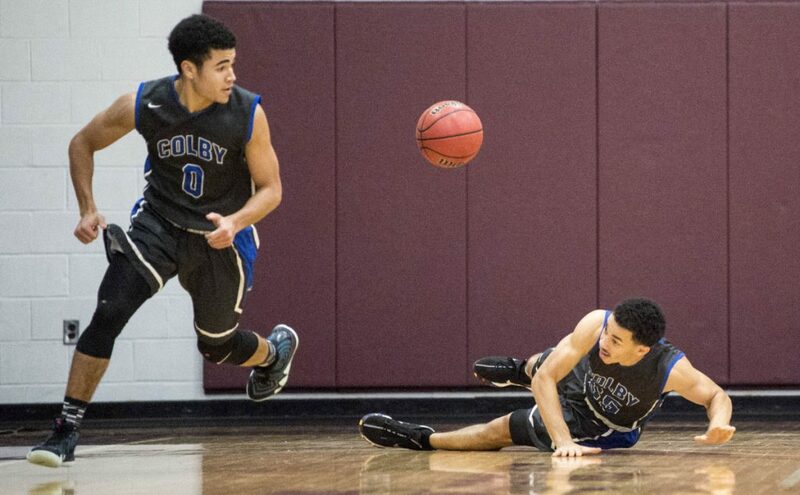 It gives us a chance to be hard to guard,” Colby coach Damien Strahorn said. The success is a product of a strong preseason, junior guard Sam Jefferson said. “We knew we had some talent, and we’ve been grinding like we haven’t in the past. The games feel easier than what we did in the fall,” said Jefferson, who scored 22 points and made five of Colby’s 15 3-pointers. Colby’s Wallace Tucker (55) looses his balance and the ball as teammate Ty Williams (0) picks up the loose ball Tuesday in Farmington. Facing a zone defense for the first time this season, the Mules were hot from the perimeter early. Colby’s first three field goals were all threes, and the Mules sank 10 threes in the first half to take a 49-32 lead into the break. Colby led by 24 points, 61-37, with just under 17 minutes to play, when the Beavers (4-2) went on a run. UMF cut its deficit to 11 points, 77-66, on an Amir Moss layup with 4:53 remaining, but that was as close as it would get. Colby closed the game with a 15-10 run. University of Maine at Farmington’s Milani Hicks dunks the ball on a break-away against Colby in the first half Tuesday in Farmington. When Jefferson wasn’t open or cold, Matt Hanna (23 points) was there to make one of his five 3-pointers. If it wasn’t Hanna, it was Noah Tyson (16 points, 13 rebounds), who made three of his four 3-pointers in the second half. “This year, I’ve been getting more open looks than I ever have because those guys can shoot just as well,” Jefferson said. Sean Gilmore came off the bench and gave the Mules offense in the low post, scoring 12 of his 16 points in the second half. Gilmore also had 10 boards, including four offensive. “We took their shot and withstood it. It wasn’t the prettiest, but it gives us something we can keep focusing on,” Strahorn said. 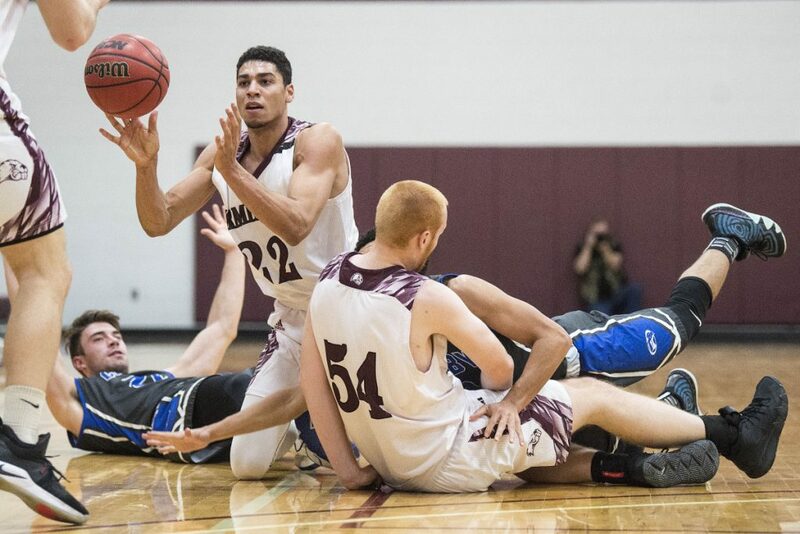 University of Maine at Farmington’s Milani Hicks (22) battles for the loose ball with Colby’s Sam Jefferson (20) as UMF’s Anthony Owens (54) tries to help out Tuesday in Farmington. 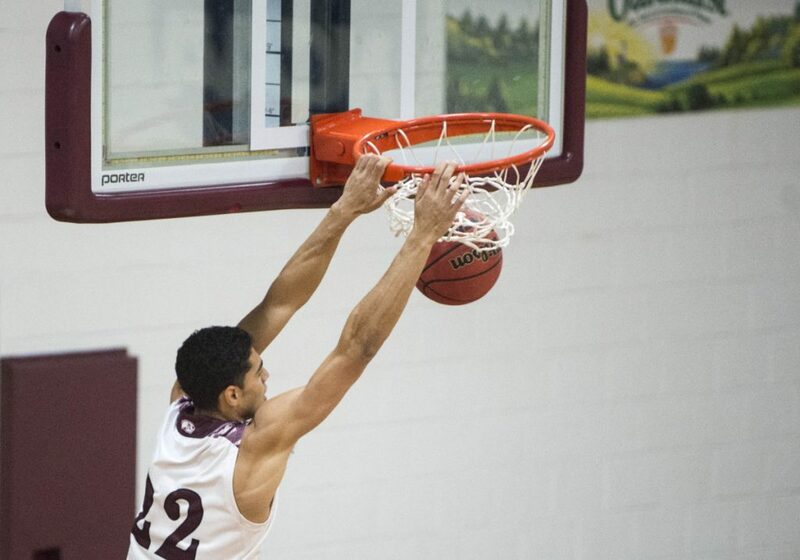 Moss scored a game-high 26 points to lead UMF. Milani Hicks added 13 points for the Beavers, while Bill Ruby and Riley Robinson each scored 12. University of Maine at Farmington’s Riley Robinson, right, battles for the rebound with Colby’s Ronan Schwarz on Tuesday in Farmington.